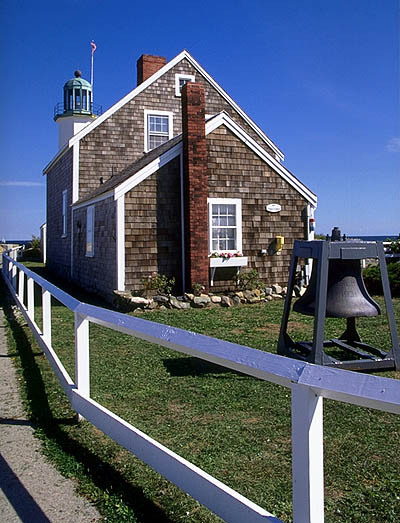 In 1810 the U.S. Congress voted the modest sum of $4000 for construction of a lighthouse at Scituate Harbor. The 50-foot tower was lit in 1811, and the original octagonal tower stands today beside the original 1811 keeper's quarters. Modifications to the tower were made over the years, but Scituate was taken out of service in 1860, replaced by the offshore light at Minot's Ledge. 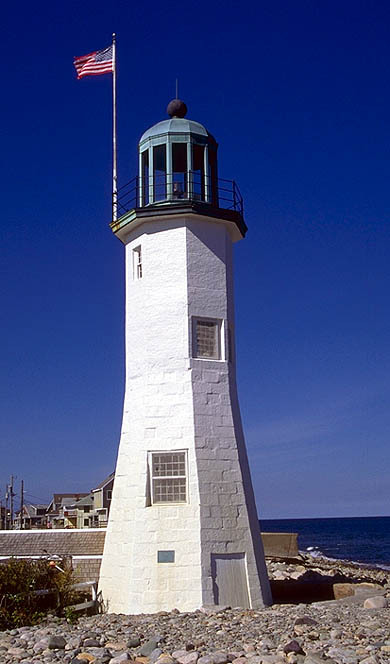 In 1990 the light was reactivated as a private aid to navigation, and today the site is owned by the town of Scituate. The Scituate Historical Society makes note of the bravery of the first lighthouse keeper's daughters. During the War of 1812, Abigail and Rebecca Bates were called the "army of two" for "preventing a British Naval Force from sacking the town by playing a fife and drum," deceiving the commander of the British warship into thinking the Americans were massing an army.